New National League of Cities (NLC) research indicates a potential slowdown in the municipal finance sector as city fiscal growth contracts for the second consecutive year. Several major findings from the report, City Fiscal Conditions 2017, signal a trend that was last seen in 2006 before the Great Recession, including waning confidence of city finance officers, slowing local revenues and insufficient post-recession revenue recovery. 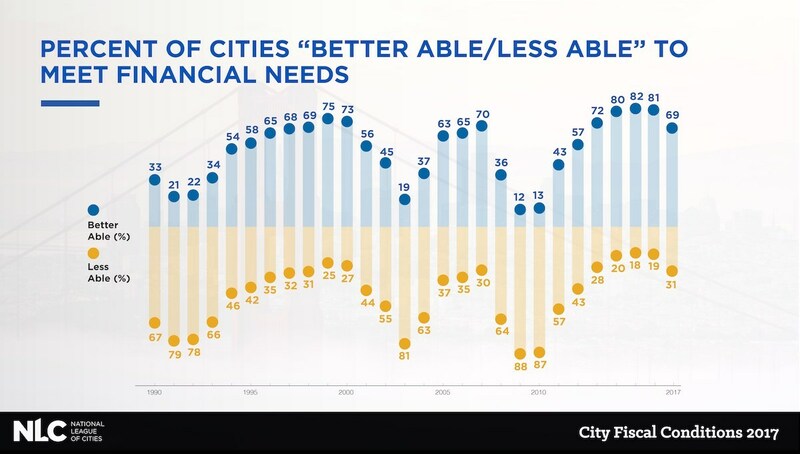 New research from the National League of Cities (NLC) shows that 69 percent of city finance officers report that their cities are better able to meet the financial needs of their communities in 2017 than in 2016, a decline from 81 percent in 2016. City Fiscal Conditions, which has been published annually by NLC since 1986, provides a window into the health of cities across the country, and helps local officials be realistic about the tools that are available to them. New research from the National League of Cities (NLC) finds post-recession trends indicate that municipal revenue growth is starting to slow. Several major findings from the report, City Fiscal Conditions 2017, signal a trend that was last seen in 2006 before the Great Recession, including waning confidence of city finance officers, slowing local revenues and insufficient post-recession revenue recovery. City Fiscal Conditions, which has been published annually by NLC since 1986, provides a window into the health of cities across the country, and helps local officials be realistic about the tools that are available to them. General Fund revenues are slowing. General Fund revenues grew by 2.61% in 2016, and revenues are projected to stagnate with just 0.9% growth in 2017. Property tax revenue growth is budgeted much lower than 2016. Finance officers have budgeted for 1.6% growth in property tax revenues in 2017, compared to 4.3% in 2016. Finance officers project a decline in sales and income tax revenues for 2017. Both sales and income tax revenues grew in 2016 (by 3.7% and 2.4%, respectively), but finance officers project a decline in 2017 (by 0.2% and 2.7%, respectively). Confidence of municipal finance officers has waned. Although the majority of finance officers (69%) are confident in the fiscal position of their cities, widespread optimism hit its peak in 2015. City Fiscal Conditions 2017 was released today in Washington at a roundtable event featuring elected officials, city leaders, analysts, economists and practitioners. They held a candid discussion of the findings, and whether this municipal-level contraction is a bellwether for the national economy. For questions or to receive an audio recording of the release event, please contact Courtney Bernard at Bernard@nlc.org or 202-626-3133.